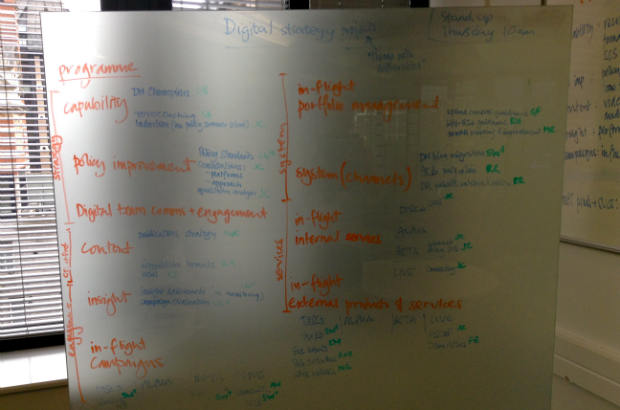 Last March, at the end of the reporting cycle for our 2013/14 digital strategy, we ran a little exercise to review how it had all gone. One of the more pleasing things we found was that our internal communications operation had been fairly successful. People in the department better understood what we were on about. We had shifted our digital awareness metric. In turn, this had stimulated extra demand for our time. People were now having more and better ideas for things we might do. The phone was ringing more. This is no bad thing. I've spent most of my career trying to increase demand for digital work, persuading people to think more digitally and do more digital stuff. But towards the end of last year, we found that there was sometimes more demand than we could cope with in the digital team. We planned and prioritised as best we could. And we did some amazing work that I'm very proud of. But we weren't that used to saying "no" to people, so we tended to manage increased demand by working harder, or by stacking up projects. Inevitably, some of the things we intended to do didn't get done, and some of the things we did do, didn't get done well enough. We're triaging ideas for things we might do. Every idea for a thing we might do, whether it comes from within the team, from elsewhere in the department, or from somewhere else, gets triaged before we start work on it. Triage is quick, and it involves some maths. We ask a bunch of questions about how well an idea fits with the strategic objectives of the department. And then every potential digital strategy project gets a score against each of our 5 big digital strategy ideas. A score of 1 = no improvement on current practice, a score of 5 = potentially revolutionary. A total score of 25 suggests that we really should do it; a total score of less than 15 means it's not yet a good enough idea. We're defining how projects will end. Last year, some pieces of work remained ongoing throughout the year without really progressing. Big important stuff, that everyone agreed was a good idea to fix, didn't move on. This year, we're addressing this by more carefully defining what we will actually do and who will do it. That means breaking up big pieces of work into smaller projects, assigning people to take responsibility for them, and defining what "done" will constitute when we start something. We're running a restricted set of live projects. We're currently running 25 live digital strategy projects. The types of project vary hugely, but each live project has clear objectives and timelines, an owner who reports progress at a weekly stand-up, and a project team with enough time to do it justice. Projects only become live when they have these things in place. Even if an idea scores 25/25 it doesn't start until we've agreed them. We're planning every week. We triage new ideas once a week, and make decisions about where resource is most needed. These are usually very pragmatic decisions, made by the heads of each of the digital teams, about relative importance, and the availability of people. We sit down to review and re-plan the whole programme every quarter, timed deliberately to coincide with some of our obligations to report on our work. And that's it: a handful of simple things we're doing to organise ourselves in ways that better support the kinds of work we need to do. Each of the things we've done differently this year has helped make our planning, decision making and progress a bit more visible to everyone involved. It's not perfect, but I think we all feel a bit more in control of what we're doing as a result. And I think we're delivering more. We've learned how to say "no" when the phone rings. Or at least, we've learned how to triage things before we say "yes". What does the DH digital team actually do? Always interesting to see how insiders are trying to take down the walls and change the culture. Don't know where this project fits in your triaging. But it would be soo nice to see a little promotion for it on your blog. (I'll point at its FB page). https://www.facebook.com/nhscitizen You'll see I've made 2 comments about the pdf. This is the first time I've seen a "Citizen Model Design" approach anywhere in the UK (or most country's) silos. Seems that everyone is setting up lots of "discovery" spaces, but not linking back to a common "gathering" space. So I can appreciate what you say about "sorting out CRMs". You might like this. The biggest prob we have is that now we have seen our orgs are composed of (topical or operational) groups, like your 5 teams. This is only natural as the catch-cry for all digitarians is "open" and "transparent". If you take a dispassionate, top down, view of the confusion it's easy to see. So we have lots of similar groups working on similar projects. What we don't have is teams (inside different orgs) with semi-related projects, focussing on a citizen.gov.uk's (user) account, and sharing a part of one "gathering" project. So this wide ranging (NHS)citizen centric project is broad enough to act as a gatherer for all sorts of "discovery" spaces.